A little bit of baking today, with a little help from the nephew with the grating of the carrots. 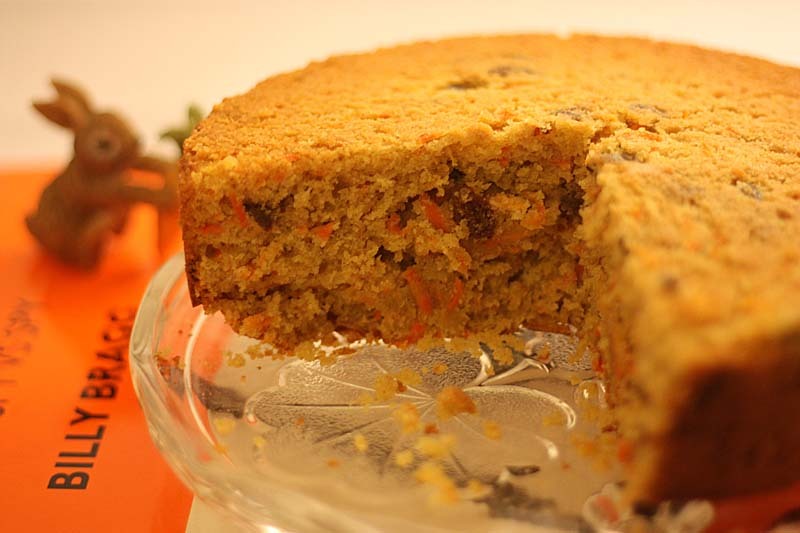 This moist cake is not overly sweet, so if you want you can spread the top with a little sweetened cream cheese, flavoured with a little orange. In a large bowl, cream the butter and sugar together until light and fluffy, then beat in the eggs. Sift in the flour, baking powder and cinnamon and gently fold in, then quickly stir in the remaining ingredients. Spoon the mixture into a 8 or 9 inch lined and greased tin. Bake for 1 – 1 ½ hour on middle shelf. Leave for 10 -15 minutes before turning out. Cool on a wire rack. Oh I love carrot cake and the addition of orange sounds amazing - looks delicious! Mangocheeks, I take it you meant "Cool on a wire rack", not "Cook..."? I have vu=isions of the mixture dripping through the wire rack onto the floor of the oven!! Sounds like a yummy recipe in any event. I would definitely go for the cream cheese topping. I love that you can still see the shreds of carrot. This must surely mean that each slice counts as one of your five-a-day! The orange is not particularly strong. Cream cheese would have given the cake another dimension, I just didn't have any at home to do so, so plain it had to be. Still pretty good though. Thats why I had to slice it! Yes, I agree I'd certainly count it as one of my five a days. I didn't presoak the sultanas and just added them to the batter. I do think it woudd have been a good idea though - perhpas in the orange juice. A lovely cake...thanks for sharing! 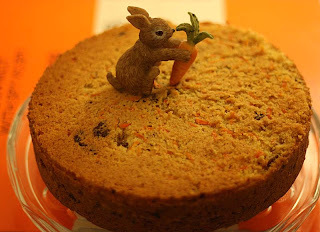 yum, that looks so tasty--carrot cake sounds really good right now. i've never had sultanas before. I'm very surprised to learn that you have not had sultanas, they are available here everywhere, usually right next to the raisins and dried fruit. I love it, and that rabbit enjoying his carrot. The rabbit frequents quite a bit on my blog. Yum....carrot and orange is a wonderful flavor mix. 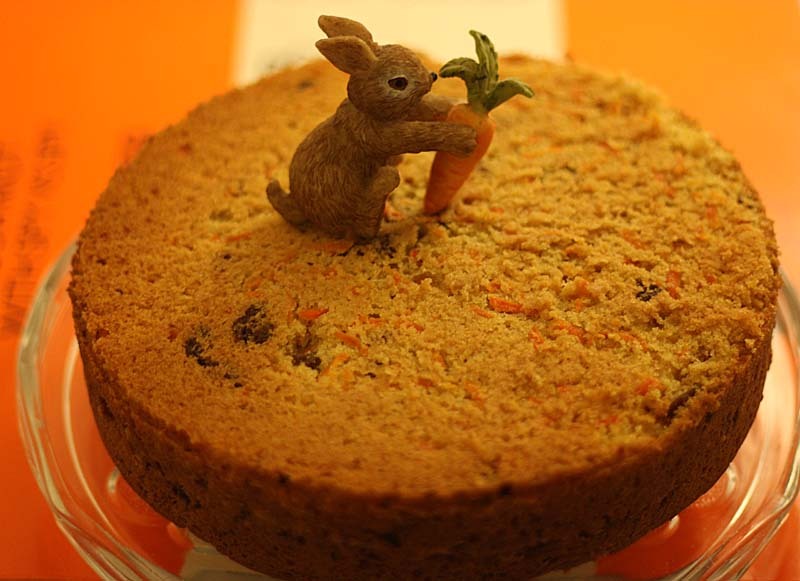 Oh my - how we love carrot cake! Happy Valentines Day! Thank you so much affectioknit. So easy recipe and I just love carrot cakes! I'll try to make it if I find some time. 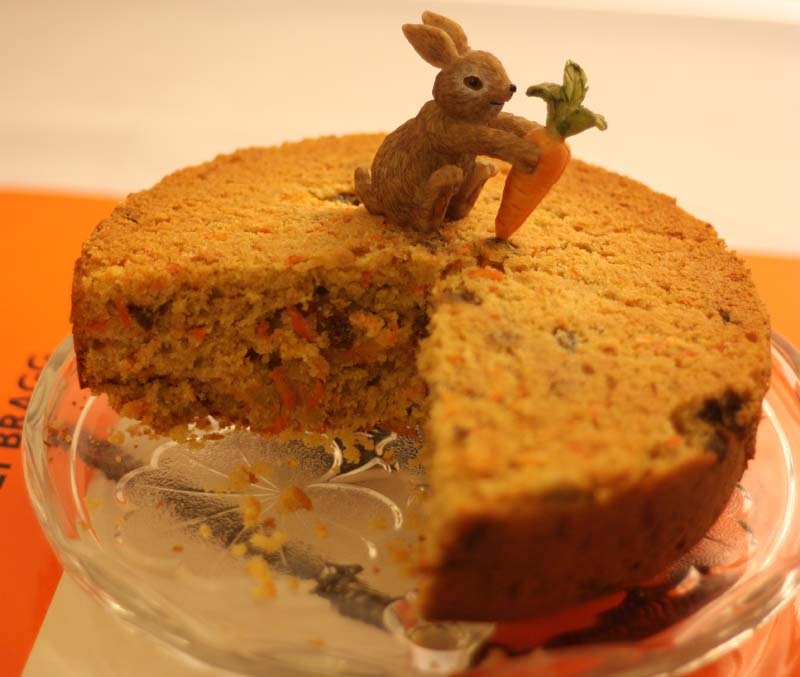 There are so many carrot cake recipes, this is just one of them. If you want you can also add 50g walnuts to the mix. That looks so good! And I love the bunny on top! I've got a soft spot for bunnies! Happy Valentines to you too. Sounds so scrummy I think I will give your recipe a go at the weekend and that is saying something 'cos I don't usually do cakes lol. I have forwarded your blog details to my sis as she was well impressed with your recipes. We had a lovely week in Perthshire - beautiful scenery stayed 20 miles from Aberfeldy near Loch Rannoch. It is a lovely recipe, if you do make it - you can if you wish add 50g chopped walnuts to the mix, I would have but did not have any at home. Thanks for forwarding my blog details to your sis - who knows I may receive a comment from her. Beautiful cake i replaced butter with Sunflower Oil... thank you.Good work ! why does my cake become stick on the top?